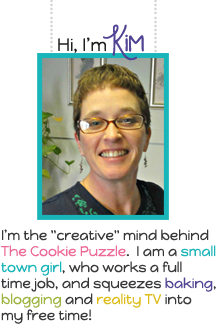 The Cookie Puzzle: I LOVE TEACHERS! I love these.. Great idea.. Would it be ok with you if i borrowed the idea. My sister is now following your blog and she requested "Hey, can you do some popcorn cookies like The COOKIE PUZZLE for Cade's teachers.. PLEASSEEEEE?" Well.. i said "i will ask if its ok".. :) So I'm asking. I love popcorn. I love cookies.. These are great. Hi Heather...oh...feel free to use the idea...I wish I could remember where I saw these at...but I got the idea from somewhere...so go for it. I responded to your question about the boxes on Facebook, but I will tell you here also, I got these boxes at Hobby Lobby, but I have seen them at Michael's also. I used the smallest cutter in the Wilton Funny Flower Cut-Outs set, I think it is like 5/8 inch in diameter. If you want more information about making these, please send me an email...I have done them several times, and have learned though trial and error what works to make the process faster! Super sweet, super cute, and you are SUPER crazy for all those cookies! Thanks Nicole...they were not that bad to make...kinda fun...in a "twisted cookie decorator" type of way! wowee zowee! That is a WHOLE LOT of cookies! I'm surprised you can still see straight after all that! Wow! You are amazing Kim! You inspire me! Kim you are a rock star and a machine! These are so awesome! Thanks for sharing them. My brother has downs and he's 32 now but when he was in school he loved his teachers. They were so great to him. I admire all teachers but I especially admire those that work with special needs children.